Actor, producer. Born January 29, 1945 in Detroit, Michigan. A talented collegiate athlete, Selleck supported himself as a model, winning small parts in films and television during the 1970s. He received his big break in 1979, when he was cast in the starring role of CBS’s detective series Magnum, PI, in which he played an easy-going private investigator. The top-rated show earned Selleck an Emmy and a Golden Globe, and he continued with the role for eight years. In 1987, he appeared in the hugely popular Three Men and a Baby alongside Ted Danson and Steve Guttenberg. 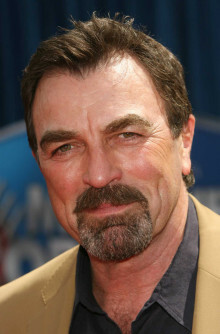 Selleck has appeared in several films since; including 1997’s In and Out (1997) and 1999’s The Love Letter. And though he’s tried his hand at producing and enjoyed a successful run as a recurring guest on the hit sitcom Friends, Selleck has yet to translate his movie star quality into true movie stardom. Selleck was married to model Jacquelyn Ray from 1970 to 1982. He married his current wife, actress Jilly Joan Mack, in 1987. The couple has one daughter, Hannah Margaret. Do you want to hire Tom Selleck? Directly request a quote. In 48 hours we can send you the availability of Tom Selleck If you would like to book Tom Selleck, Entertainment Booking Agency is the right place. We will offer you the best price and contact the management or we directly contact Tom Selleck. For corporate appearances or speaking engagements you can contact our agents and the will help you true the process. Tags: hire Tom Selleck, Tom Selleck booking, book Tom Selleck, Tom Selleck appearances, find more information on booking Tom Selleck for appearances, Tom Selleck speaking engagements, Tom Selleck endorsements/spokesperson, Tom Selleck appearance fees, Tom Selleck booking agency contact info, biography of Tom Selleck, Contact an artist booking talent agent find a speakers bureau that can book Tom Selleck, speaker booking agency for Tom Selleck, Tom Selleck booking agency, Tom Selleck booking for corporate event. EBA is one of the biggest entertainment booking agencies in the World. We book hundreds of celebrities, artist, athletes and speakers in a year. Important to know is that we are not claiming to be the management of Tom Selleck. We are not the official agent for Tom Selleck. Companies from around the globe book these artists and speakers true our company be course we have one of the biggest networks and we always have direct contact with the artist or the management. We help you to find the right celebrities for your corporate of private events. Please contact one of our agents to get free advice and we will help to get the world-famous artist on your party.